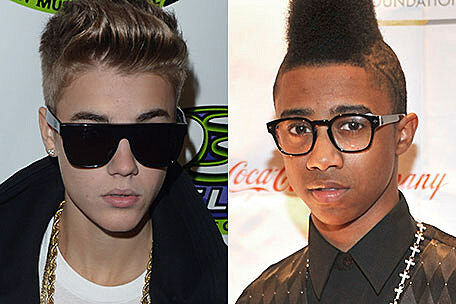 Young Money rapper Lil Twist was apparently behind the wheel of Justin Bieber s Ferrari yesterday (Jan. 1), when a paparazzo was struck by a motorist and killed. The 19-year-old Lil Wayne protege was spotted with Bieber at the Four Seasons in Beverly Hills prior to the accident, and left in the singer's white Ferrari, without Bieber. Unfortunately, Twist quickly caught the attention of California Highway Patrol, who pulled him over for speeding on the 405 freeway. Photographer Chris Guerra, who had been tailing the car, parked across the freeway, attempting to snap photos of Bieber, whom he allegedly believed to have been smoking marijuana in the car earlier. Guerra was advised by police to return to his car, but was sadly struck and killed crossing the highway. "Hopefully this tragedy will finally inspire meaningful legislation and whatever other necessary steps to protect the lives and safety of celebrities, police officers, innocent bystanders and the photographers themselves," Bieber said in a statement. A representative for Lil Twist claims that while he did not see the actual accident occur, he sends his thoughts and prayers to the family of the photographer. Bieber and Twist have been photographed partying together for the past several weeks, popping bottles in Mexico on New Year's Eve, where they are both of legal drinking age.